The capture of Luxeuil-les-Bains marked the end of the pursuit of the Nineteenth German Army. Up until this time the VI Corps, with the 36th Division on the left, the 3rd Division in the center and the 45th on the right, had been driving for the Belfort Gap. The First French Army, which had captured Toulon and Marseilles and then moved up the west bank of the Rhone Valley, was given the mission of forcing the Belfort Gap. The VI Corps was ordered to change the direction of its attack and drive straight across the Vosges between the Belfort Gap and the Saverne pass. To accomplish this it became necessary for the First French Army to move across the rear of the VI Corps, relieve the 45th Division and the right of the 3rd Division. The 45th Division was then to move to the left of the 36th and the 3rd was to come up abreast of it on the right. As this regrouping of forces would require some time, it appeared that the 36th might get a few days of badly needed rest. Such was not to be, however. Because of the VI Corps new direction of attack, the 36th found itself well in front of the remainder of the corps and only one days motor march from the Moselle River. It was evident that the Germans planned to defend this considerable obstacle as far north as possible. Few usable crossings existed and defensive works on the east bank had been prepared. The autumnal rains had begun and, momentarily, floods which would make any crossing exceedingly difficult were to be expected. Motorized reconnaissance by the 36th Reconnaissance Troop and the Reconnaissance Company of the 636th Tank Destroyer Battalion indicated that Remiremont was held in force and that the Luxeuil-les-Bains-Remiremorit road was heavily defended. To the north, however, the road from Luxeuil to Plombieres was open. If the German plan to defend the Moselle was to be circumvented it was imperative to move at once to seize a bridgehead over the river. The 36th, because of its location, was the logical choice to do the job. The period of rest would have to wait. At the single crossing site men pressed over the Moselle River to carve out the initial bridgehead. Therefore, during the afternoon of September 19, General Truscott ordered the 36th to move without delay up to the Moselle in preparation for a crossing. The 3rd Battalion, 142nd Infantry, commanded by Major Everett S. Simpson, and Lt. Col. John N. Greens 132nd Field Artillery Battalion were ordered to move out at once via Plombieres to seize the heights overlooking Remiremont and to prepare to attack the city the next day. At daylight next morning the Division planned to move out in two columns, capture Remiremont and seize the west bank of the Moselle as far as Eloyes in preparation for a crossing. The 142nd RCT (less the 3rd Battalion and its artillery) on the right was to take the road from Luxeuil through le Val-dAjol to Remiremont. The 141st RCT on the left was to take the road through Plombieres to the heights north of Remiremont. The 143rd RCT was to follow the 141st as Division reserve. The 142nd encountered bitter fighting soon after it left Luxeuil. The 3rd Battalion and its artillery, which had succeeded in making a surprise move the night before almost to the outskirts of Remiremont, was heavily engaged in attacking the heights just northwest of the city. The 1st Battalion, under Major James L. Minor, made contact on secondary roads east of le Val-dAjol and was forced to fight two days and nights to overcome the resistance there. Meanwhile, the 2nd Battalion, under Lt. Col. Samuel S. Graham, by-passed the resistance holding up the 1st Battalion and, marching by trails and secondary roads, moved to join the 3rd Battalion. Several miles from the city, however, it, too, encountered strong road blocks, the reduction of which was slow and difficult because of the rugged, heavily-wooded terrain. The 141st moved without incident and at 0900 had reached the wooded hills between Remiremont and Eloyes. Reconnaissance of the river in its sector was immediately started. When Col. Clyde Steel, the Regimental Commander, told the Division Commander at noon that he thought a crossing that night was feasible, the order to cross was given and this information sent to the Corps Commander who ap. proved. To attempt to cross without more preparation was risky, as the Germans were still in force on our side of the river and might attack the flank of any crossing operation. It was apparent that the 142nd was not going to be able to capture Remiremont and drive the Germans out for at least two days. Boats for the crossing were not available and would not be until late the next day. Only one practicable crossing site existed, an old ford without adequate approach roads. Detailed reconnaissance by lower echelons would be impossible and supporting fires would have to be extemporized. However, it would also be risky to wait. The speed of our advance from Luxeuil had surprised the German defender. In another day he would be able to move in heavy forces to cover the river at the proposed crossing site. No roads led from the assembly areas to the river, only small trails. The terrain was extremely rugged and heavily wooded. Guides had to be found. The 70-year-old Mayor of the little village of Raon-aux-Bois, a retired French Naval Officer, extended his services. Starting at midnight he led the regimental column straight across the hills through the forests to a place on the flats opposite a bend in the river where the ford was supposed to be. Veterans who remembered the bloody attempts to cross the Rapido noted the similarity between the deadly S-bend in the Italian river and the curving of the Moselle. The leading battalion, the 2nd of the 141st, under Lt. Col. James Critchfield, moved downstream on the near side of the river to a point opposite the town of Eloyes which it was to attack as a feint. The next battalion in column, the 1st, under Lt. Col. Victor E. Sinclair, deployed and moved toward the wooded banks of the river where it was to cross. 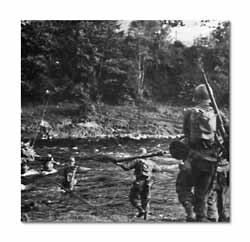 The last battalion, the 3rd, under Major Kermit Hansen, got separated from the others and reached the river about a mile and a half upstream from the ford. With movement through the rough terrain in pitchblack darkness extremely slow and daylight about to break, Major Hansen decided that he would have to cross where he was. He led a platoon of I Company, commanded by Captain Roy F. Sentilies, across the river by fording. As they reached the other side and started to fan out they were hit by the fire of eight heavy machine guns centered on the shallows where the crossing had been made. Captain Sentiles and several others were killed, the, remainder of the platoon were wounded and only four survived. Before he was taken, Major Hansen managed to send word by radio to Move the remainder of the battalion downstream to follow the 1st Battalion. The 1st Battalion, meanwhile, had reached the chosen ford. It was a ford but it was shoulder deep. An engineer, Cpl. Walter Lindsay, swam the icy river with a rope tied to his belt and fastened the rope to a tree. Using this as a guide, the battalion started across. Their bandoliers lashed on packs and rifles held high, they clung to the guide rope and battled the stiff current to the other side. Ammunition bearers, loaded and soaking wet, made their way across, slipped and fell, but kept on going. This was far different from the usual river crossing where assault wave follows assault wave on a broad front in boats. Here the crossing had to be made in single file. Soon the alerted enemy opposite this crossing, fortunately not very numerous, turned their mortars on the ford. When snipers from the hills and flanks spattered the water with their shots and almost severed the life-line, another was slung across in a more sheltered spot. The first men over moved out in a semi-circle, gaining the steep bank and a few hundred yards of exposed flank. Slowly the bridgehead expanded, but movement across the river was difficult. It was afternoon before the First Battalion was over. Then came the reorganized 3rd Battalion. Meanwhile, downstream a couple of miles, the 2nd Battalion, in a splendid coordinated attack, had captured that part of Eloyes on the west bank or near side of the river, and threatened to cross in that sector. The enemy reacted violently and kept the bulk of his forces in that area because it was the logical place for a crossing. It was apparent early in the morning that the 141st did not have sufficient strength to seize and hold an area large enough to permit a bridge to be built. The 143rd was therefore moved up and ordered to cross immediately behind the 141st and, once over, to strike downstream to capture Eloyes and the hills surrounding it. 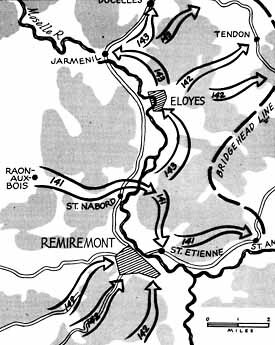 The 141st (less the 2nd Battalion) was ordered to move upstream and capture St. Etienne, the town opposite Remiremont, to prevent escape of the Germans from Remiremont. The fight for Remiremont was going slowly. The Germans were desperate in their efforts to hold it. However, the 142nd. was not to be denied. The 3rd Battalion seized the ancient stone fort on the high hill just out of town and then started forcing its way into the suburbs, house by house. The 1st Battalion finally crushed the last resistance out of le Girmont-Val dAjol and hiked over the hills to the heights southwest of town while the 2nd Battalion inched forward against road block after road block. On the morning of the 23rd the final mop-up within Remiremont cleared the town. Earlier, fleeing German elements had crossed the river and blown the road-bridge. By this time at the original crossing site near St. Nabord the engineers had installed a pontoon bridge, and light vehicles and weapons were pouring across to the bridgehead. A heavy steady rain seriously affected the muddy, rutted approaches that had had to be routed over soft fields to the river. 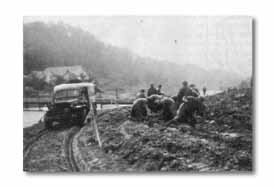 Engineers worked round-the-clock with shovels, with guidemarkers, pulling jeeps out of holes, directing and shouting, urging the traffic across. Near-by artillery howitzers, emplaced along the main road and railroad, kept up a clatter to screen advancing troops on the far side. A rugged, hilly, heavily-wooded obstacle confronted the Division east of the Moselle. After Eloyes, the 143rd moved north to seize Jarmenil while the 141st struck south and east to take St. Arne, widening the salient to ten miles. But in the center only little trails penetrated over the hills on the axis of advance. Here the 143rd, turning northwest from Jarmenil followed the good road to Docelles, beat off a counterattack south of the town and experienced heavy enemy artillery fire before winning it on September 26th. Increased enemy pressure began to show itself on the Division right flank. The 142nds advance on Tendon which had cut the lateral Docelles-Le Tholy road, had to be called back temporarily when enemy infiltrations and fresh German strength seriously threatened the security of the bridgehead. On top of this, rain lasting for several days combined with the autumn cold to impose a bitter hardship on the attacking infantry. As it had been in Italy, there were few places of shelter in these scrubby highlands. Extreme fatigue caused more casualties than battle and reduced fighting strengths to a nub. Moving forward again, Tendon was gained by the 2nd Battalion, 142nd, on September 27th. The fighting moved to the hill mass east of Tendon and to a lengthy road block on the main Le Tholy road. For three long days and nights all three battalions were involved in an exhausting battle about Hill 827, until it was finally secured. The road block resisted repeated efforts to take it until the morning of October 1st. Afterward the Germans poured such heavy artillery upon it that two tank dozers were lost as they tried to clear it. The 1st Battalion, 141st, captured a German battle group in taking St. Ame on the extreme right of the bridgehead. Elements of the 3rd Infantry Division were crossed into the bridgehead and began relief of the 141st units at St. Ame on September 26. On the 28th the 141st motored by way of Eloyes and Docelles to an assembly area between the 143rd and 142nd near Xamontarupt. Bruyeres now became the Division objective with the 141st attacking on the right of the 143rd. At the jump-off up the valley toward St. Jean and Houx, German artillery countered heavily to throw back the first attack. But slowly the 141st ground out gains until an objective line at Herpelmont was reached. The Moselle Bridgehead, now more than 25 square miles, stood firm. Bridges were well established. Other units, the 3rd and 45th Divisions, were moving across into it and VI Corps operations reached out from it. But it became clear that German resistance had toughened and that a continuous, slow-moving front had been formed.